The Amazon Kindle is a series of e-readers designed and marketed by Amazon. Amazon Kindle devices enable users to browse, buy, download, and read e-books, newspapers, magazines and other digital media via wireless networking to the Kindle Store. The hardware platform, developed by Amazon subsidiary Lab126, began as a single device in 2007 and now comprises a range of devices, including e-readers with E Ink electronic paper displays and Kindle applications on all major computing platforms. All Kindle devices integrate with Kindle Store content, and as of March 2018, the store has over six million e-books available in the United States. 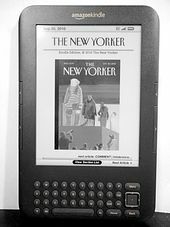 In 2004, Amazon founder and CEO Jeff Bezos instructed the company's employees to build the world's best e-reader before Amazon's competitors could. Amazon originally used the codename Fiona for this e-reader. The Kindle name was devised by branding consultants Michael Cronan and Karin Hibma. Lab126 asked them to name the product, so Cronan and Hibma suggested Kindle, meaning to light a fire. They felt this was an apt metaphor for reading and intellectual excitement. Kindle hardware has evolved from the original Kindle introduced in 2007 and the Kindle DX (with its larger screen) introduced in 2009. The range includes devices with a keyboard (Kindle Keyboard), devices with touch-sensitive, lighted high-resolution screens (Kindle Paperwhite), a tablet computer with the Kindle app (Kindle Fire), and low-priced devices with a touch-sensitive screen (Kindle 7). However, the Kindle e-reader has always been a single-purpose device for reading – rather than being multipurpose hardware that might create distractions while reading. Amazon has also introduced Kindle apps for use on various devices and platforms, including Microsoft Windows, macOS, Android, iOS, BlackBerry 10 and Windows Phone. Amazon also has a cloud reader to allow users to read e-books using modern web browsers. 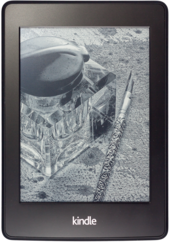 This article focuses on Amazon's E Ink e-readers; for the LCD tablets that formerly included the Kindle name refer to Kindle Fire, Fire HD, and Fire HDX. Amazon released the Kindle, its first e-reader, on November 19, 2007, for US$399. It sold out in five and a half hours. The device remained out of stock for five months until late April 2008. The device features a 6-inch (diagonal) 4-level grayscale E Ink display, with 250 MB of internal storage, which can hold approximately 200 non-illustrated titles. It also has a speaker and a headphone jack that allows the user to listen to audio files on Kindle. It is the only Kindle with expandable storage, via an SD card slot. The device's Whispernet feature was co-designed with Qualcomm, and Kindle was the first device to include free U.S.-wide 3G data access to browse and download e-books from Amazon's Kindle Store. Amazon did not sell the first generation Kindle outside the U.S.
On February 10, 2009, Amazon announced the Kindle 2, the second generation Kindle. It became available for purchase on February 23, 2009. The Kindle 2 features a text-to-speech option to read the text aloud, and 2 GB of internal memory of which 1.4 GB is user-accessible. By Amazon's estimates, the Kindle 2 can hold about 1,500 non-illustrated books. Unlike the first generation Kindle, Kindle 2 does not have a slot for SD memory cards. It was slimmer than the original Kindle. The Kindle 2 features a Freescale 532 MHz, ARM-11 90 nm processor, 32 MB main memory, 2 GB flash memory and a 3.7 V 1,530 mAh lithium polymer battery. To promote the Kindle 2, in February 2009 author Stephen King released Ur, his then-new novella, available exclusively through the Kindle Store. On July 8, 2009, Amazon reduced price of the Kindle 2 from $359 to $299, then in October 2009, Amazon further reduced the price to $259. The Kindle 2 had a manufacturing materials cost estimated at $185.49, in 2009 by iSuppli. On October 22, 2009, Amazon stopped selling the original Kindle 2 and sold the Kindle 2 international version worldwide. On November 24, 2009, Amazon released a firmware update for the Kindle 2 that increased battery life by 85% and introduced native PDF file support for the device. On October 7, 2009, Amazon announced an international version of the Kindle 2 with the ability to download e-books wirelessly in over 100 countries. It became available October 19, 2009. The international Kindle 2 is physically the same as the U.S.-only Kindle 2, although it uses a different mobile network standard. The original Kindle 2 used CDMA2000 for use on the Sprint network. The international version used standard GSM and 3G GSM, enabling it to be used on AT&T's U.S. mobile network and internationally in 100 other countries. 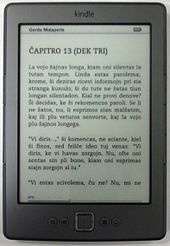 The international version of the Kindle 2 is believed to have a higher display contrast, although Amazon did not advertise this. A review by Gadget lab disputes that the contrast was higher and actually states that the font appears to be fuzzier than that of the first Kindle. The review goes on to say that changes to the Kindle 2 have made it harder to read the smaller font sizes that most books use. Some writers discuss how the font size is at times worse than that of the first generation Kindle. Amazon announced the Kindle DX on May 6, 2009. This device has a larger screen than the standard Kindle and supports PDF files. It is marketed as more suitable for displaying newspaper and textbook content. It has an accelerometer, which enables the user to seamlessly rotate pages between landscape and portrait orientations when the Kindle DX is turned on its side and it includes built-in speakers. The device can only connect to Whispernet in the U.S.
On January 19, 2010, the Kindle DX international version was released in over 100 countries. The Kindle DX international version is the same as the Kindle DX except for having support for international 3G data. On July 1, 2010, Amazon released the Kindle DX Graphite (DXG) globally. The DXG has an E Ink display with 50% better contrast ratio due to using E Ink Pearl technology and comes only in a graphite case color. It is speculated the case color change is to improve contrast ratio perception further, as some users found the prior white casing highlighted that the E Ink background is light gray and not white. Like the Kindle DX, it does not have a Wi-Fi connection. The DXG is a mix of third-generation hardware and second-generation software. The CPU has the same speed as Kindle Keyboard's CPU, but the DXG has only half the system memory, 128MB. Due to these differences, the DXG runs the same firmware as Kindle 2. Therefore, DXG cannot display international fonts, like Cyrillic, Chinese, or any other non-Latin font, and PDF support and the web browser are limited to matching the Kindle 2's features. Amazon withdrew the Kindle DX from sale in October 2012, but in September 2013 made it available again for a few months. Using 3G data is free when accessing the Kindle Store and Wikipedia. Downloading personal documents via 3G data costs about $1 per megabyte. Its battery life is about one week with 3G on and two weeks with 3G off. Text-to-Speech and MP3 playback are supported. Amazon announced the third generation Kindle, later renamed "Kindle Keyboard", on July 28, 2010. Amazon began accepting pre-orders for the Kindle Keyboard as soon as it was announced and began shipping the devices on August 27, 2010. On August 25, Amazon announced that the Kindle Keyboard was the fastest-selling Kindle ever. While Amazon does not officially add numbers to the end of each Kindle denoting its generation, reviewers, customers and press companies often referred to this Kindle as the "K3" or the "Kindle 3". The Kindle Keyboard has a 6-inch screen with a resolution of 600x800 (167 PPI). The Kindle Keyboard was available in two versions. One of these, the Kindle Wi-Fi, was initially priced at $139 and connects to the Internet via Wi-Fi networks. The other version, called the Kindle 3G, was priced at $189 and includes both 3G and Wi-Fi connectivity. The built-in free 3G connectivity uses the same wireless signals that cell phones use, allowing it to download and purchase content from any location with cell service. The Kindle Keyboard is available in two colors: classic white and graphite. Both versions use an E Ink "Pearl" display, which has a higher contrast than prior displays and a faster refresh rate than prior e-ink displays. However, it remains significantly slower than traditional LCDs. An ad-supported version, the "Kindle with Special Offers", was introduced on May 3, 2011, with a price $25 lower than the no-ad version, for $114. On July 13, 2011, Amazon announced that due to a sponsorship with AT&T, the price of the Kindle 3G with ads would be $139, $50 less than the Kindle 3G without ads. The Kindle Keyboard is 0.5 inches shorter and 0.5 inches narrower than the Kindle 2. It supports additional fonts and international Unicode characters and has a Voice Guide feature with spoken menu navigation from the built-in speakers or audio jack. Internal memory is expanded to 4 GB, with approximately 3 GB available for user content. Battery life is advertised at up to two months of reading half an hour a day with the wireless turned off, which amounts to roughly 30 hours. The Kindle Keyboard generally received good reviews after launch. Review Horizon describes the device as offering "the best reading experience in its class" while Engadget states, "In the standalone category, the Kindle is probably the one to beat". The fourth-generation Kindle and the Kindle Touch were announced on September 28, 2011. They retain the 6-inch, 167-PPI e-ink display of the 2010 Kindle model, with the addition of an infrared touch-screen control on the Touch. They also include Amazon's experimental web-browsing capability with Wi-Fi. The fourth-generation Kindle was significantly less expensive (initially $79 ad supported, $109 no ads) and features a slight reduction in weight and size, with a reduced battery life and storage capacity, compared to the Kindle 3. It has a silver-grey bezel, 6-inch display, nine hard keys, a cursor pad, an on-screen rather than physical keyboard, a flash storage capacity of 2 GB, and an estimated one month battery life under ideal reading conditions. Amazon introduced two versions of touchscreen Kindles: the Kindle Touch, available with Wi-Fi (initially $99 ad-supported, $139 no ads), and the Kindle Touch 3G, with Wi-Fi/3G connectivity (initially $149 ad-supported, $189 no ads). The latter is capable of connect via 3G to the Kindle Store, download books and periodicals, and access Wikipedia. Experimental web browsing (outside Wikipedia) on Kindle Touch 3G is only available over a Wi-Fi connection. (Kindle Keyboard does not have this restriction). The usage of the 3G data is limited to 50MB per month. Like the Kindle 3, the Kindle Touch has a capacity of 4 GB and battery life of two months under ideal reading conditions, and is larger than the Kindle 4. The Kindle Touch began to ship on November 15, 2011 (U.S. only). Amazon announced in March 2012 that the device would be available in the UK, Germany, France, Spain and Italy on April 27, 2012. 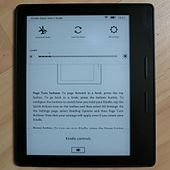 The Touch was the first Kindle to support X-Ray, which lists the commonly used character names, locations, themes, or ideas in a book. In January 2013, Amazon released the 5.2.0 firmware that updated the operating system to match the Paperwhite's interface with the Touch's MP3/audiobook capabilities remaining. Amazon announced a new version of the regular Kindle on September 6, 2012. The Kindle 5 was released on September 6, 2012 ($70 ad-supported, $90 no ads). The Kindle has a black bezel, differing from the Kindle 4 which was available in silver-grey, and has better display contrast. Amazon also claims that it has 15% faster page loads. It has a 167 PPI display and was the lightest Kindle at 5.98 oz until 2016's Kindle Oasis. The Kindle Paperwhite (1st generation) was announced on September 6, 2012, and released on October 1. It has a 6 in, 212 PPI E Ink Pearl display (758×1024 resolution) with four built-in LEDs to illuminate the screen. It was available in Wi-Fi ($120 ad-supported, $140 no ads) and Wi-Fi + 3G ($180 ad-supported, $200 no ads) models, with the ad-supported options only intended to be available in the United States. The light is one of the main features of the Paperwhite and it has a manually adjusted light level. The 3G access restrictions are the same as the Kindle Touch, and usage of the 3G data is limited to 50 MB per month and only on Amazon and Wikipedia's websites; additional data may be purchased. Battery life is advertised as up to eight weeks of reading with half an hour per day with wireless off and constant light usage; this usage equals 28 hours. The official leather cover for the Paperwhite uses the hall effect sensor in the device that detects when the cover is closed/opened to turn the screen off/on respectively. This device was the first Kindle to track one's reading speed to estimate when one will finish a chapter or book; this feature was later included with updates to the other Kindles and Kindle Fire tablets. The Kindle Paperwhite lacks physical buttons for page turning and does not perform auto-hyphenation. Except for the lock screen/power button at its bottom, it relies solely on the touchscreen interface. In November 2012, Amazon released the 5.3.0 update that allowed users to turn off recommended content on the home screen in Grid View (allowing two rows of user content) and included general bug fixes. In March 2014, the Paperwhite 5.4.4 update was released that added Goodreads integration, Kindle FreeTime to restrict usage for children, Cloud Collections for organization and Page Flip for scanning content without losing your place, which closely matched the Paperwhite 2's software features. The Kindle Paperwhite was released in most major international markets in early 2013, with Japan's version including 4 GB of storage, and in China on June 7, 2013; all non-Japan versions have 2 GB of storage (1.25 GB usable). Engadget praised the Paperwhite, giving it 92 out of 100. The reviewer liked the front-lit display, high contrast, and useful software features, but did not like that it was less comfortable to hold than the Nook, the starting price includes ads, and it had no expandable storage. Shortly after release, some users complained about the lighting implementation on the Kindle Paperwhite. While not widespread, some users found the lighting to be inconsistent, causing the bottom edge to cast irregular shadows. Also, some users complained that the light can only be dimmed, not turned off completely. Amazon announced the Kindle Paperwhite (2nd generation), marketed as the "All-New Kindle Paperwhite" and colloquially referred to as the Paperwhite 2, on September 3, 2013; the Wi-Fi version was released in on September 30 ($120 ad-supported, $140 no ads), and the 3G/Wi-Fi version was released in the U.S. on November 5, 2013 ($190 ad-supported, $210 no ads). The Paperwhite 2 features a higher contrast E Ink Carta display technology, improved LED illumination, 25% faster processor (1 GHz) that allows for faster page turns, and better response to touch input compared to the original Paperwhite. It has the same 6" screen with 212 PPI, bezel and estimated 28-hour battery life as the original Paperwhite. The software features dictionary/Wikipedia/X-Ray look-up, Page Flip that allows the user to skip ahead or back in the text in a pop-up window and go back to the previous page, and Goodreads social integration. The Paperwhite 2 uses a similar experimental web browser with the same 3G data usage restrictions as previous Kindles; there are no usage restrictions when using Wi-Fi. The official Amazon leather cover for the Paperwhite 2 is the same item as was used for the original Paperwhite. The cover's magnets will turn the screen on/off when it is opened/closed. Although released in September 2013 with 2GB of storage, the Kindle Paperwhite 2 (model DP75SDI) was released in most major international markets by the middle of 2014 in a version that includes 4 GB of storage. As of September 2014, the U.S. version also includes 4GB of storage. Engadget rated the Paperwhite 2 a 93 out of 100, saying while the "all-new" Paperwhite does not offer many new features compared to the original model, but "an improved frontlight and some software tweaks have made an already great reading experience even better." Amazon announced an upgraded basic Kindle and the Kindle Voyage on September 18, 2014. The Kindle 7 was released on October 2, 2014 ($80 ad-supported, $100 no ads). It is the first basic Kindle to use a touchscreen for navigating within books and to have a 1 GHz CPU. It is the first basic Kindle available in international markets such as India, Japan and China. Amazon claims that a single charge lasts up to 30 days if used for 30 minutes a day without using Wi-Fi. Kindle Voyage with origami cover. The Kindle Voyage was released on November 4, 2014, in the U.S. It has a 6-inch, 300 ppi E Ink Carta HD display, which was the highest resolution and contrast available in e-readers as of 2014 with six LEDs with an adaptive light sensor that can automatically illuminate the screen depending on the environment. It is available in Wi-Fi ($200 ad-supported, $220 no ads) and Wi-Fi + 3G ($270 ad-supported, $290 no ads) models. Its design features a flush glass screen on the front and the rear has angular, raised plastic edges that house the power button, similar to the Fire HDX. The Voyage uses "PagePress", a navigation system that has sensors on either side of the screen that turns the page when pressed. PagePress may be disabled, but the touchscreen is always active. It has over 3 GB of user storage. Amazon claims it has 6 weeks of battery life if used for 30 minutes per day with wireless disabled and brightness set to 10, which is about 21 hours. The Verge gave the Voyage a 9.1 out of 10, saying that "this is the best E Ink e-reader I've used, and it's unquestionably the best that Amazon has ever made. The thing is, it's only marginally better than the fantastic Paperwhite in several ways, and significantly better in none" and with those differences in mind, disliked how it costs $80 more than the Paperwhite. Engadget gave the Voyage a 94 out of a 100, stating that while it was "easily the best e-reader that Amazon has ever crafted," it was also the priciest at $199. The Kindle Paperwhite (3rd generation), marketed as the "All-New Kindle Paperwhite" and colloquially referred to as the Paperwhite 3 and Paperwhite 2015, was released on June 30, 2015, in the US. It is available in Wi-Fi ($120 ad-supported, $140 no ads) and Wi-Fi + 3G ($190 ad-supported, $210 no ads) models. It has a 6-inch, 1440×1080, 300 ppi E Ink Carta HD display, which is twice the pixels of the original Paperwhite and has the same touchscreen, four LEDs and size as the previous Paperwhite. It has over 3 GB of user accessible storage. This device improved on the display of PDF files, with the possibility to select text and use some functionalities, such as translation on a PDF's text. Amazon claims it has 6 weeks of battery life if used for 30 minutes per day with wireless off and brightness set to 10, which is about 21 hours. 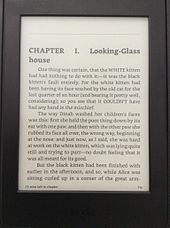 The Paperwhite 3 is the first e-reader to include the Bookerly font, a new font designed by Amazon, and includes updated formatting functions such as hyphenation and improved spacing. The Bookerly font was added to most older models via a firmware update. The official Amazon leather cover for the Paperwhite 3 is the same item as was used with the previous two Paperwhite devices. In February 2016, the Paperwhite 2, Paperwhite 3, Kindle 7, and Voyage received the 5.7.2 update that included a new home screen layout, an OpenDyslexic font choice, improved book recommendations and a new quick actions menu. On June 30, 2016, Amazon released a white version of the Paperwhite 3 worldwide; the only thing different about this version is the color of the shell. In October 2016, Amazon released the Paperwhite 3 "Manga Model" in Japan that has a 33 percent increase in page-turning speed and includes 32GB of storage, which is space for up to 700 manga books. The Manga model launched at 16,280 yen (~$156) for the ad-supported Wi-Fi version or 12,280 yen (~$118) for Prime members. The Verge gave the Paperwhite 3 a 9.0 out of 10, saying that "The Kindle Paperwhite is the best e-reader for most people by a wide margin" and liked the high-resolution screen but disliked that there was no adaptive backlight; this is featured on the Kindle Voyage. Popzara called the 2015 Paperwhite "the best dedicated E Ink e-reader for the money." Amazon announced the Kindle Oasis (1st generation) on April 13, 2016, and it was released on April 27 worldwide. The Kindle Oasis is available in Wi-Fi ($290 ad-supported, $310 no ads) and Wi-Fi + 3G ($360 ad-supported, $380 no ads) models. The Oasis has a 6-inch, 300 ppi E Ink Carta HD display with ten LEDs. Its asymmetrical design features physical page turn buttons on one side and it has an accelerometer so the display can be rotated for one-hand operation with either hand. It has one thicker side that tapers to an edge that is 20% thinner than the Paperwhite. It includes a removable leather battery cover for device protection and increased battery life that is available in either black, walnut (brown) or merlot (red); the cover fits in the tapered edge. The Oasis has 28 hours of battery life if used with the battery cover with Wi-Fi off, however, without the cover, the Oasis battery lasts about seven hours. It has nearly 3 GB of user storage. The Oasis includes the Bookerly (serif) font and it is the first Kindle to include the Amazon Ember (sans-serif) font. The Guardian's reviewer praised the Oasis's ease in holding, it weighing next to nothing without the cover attached, its long battery life, excellent display, even front lighting, and usable page-turn buttons, and the luxurious feel of the leather cover; however, the reviewer did not like that it was so expensive, that the battery cover only partially protects the back, and that the reader is not waterproof. The reviewer concluded, "…the Paperwhite will likely be all the e-reader most will need, but Oasis is the one you'll want. The Oasis is the Bentley to the Paperwhite’s Golf - both will get the job done, just one is a cut above the other." The Verge gave the Oasis a 9/10, praising its thinness, its weight without the cover and the ability to read with one hand, but did not like that is so expensive, has no adaptive backlight like the Voyage and it is not waterproof. Amazon's upgrade of the standard Kindle was released on June 22, 2016 in both black and white colors ($80 ad-supported, $100 no ads). The Kindle 8 features a new rounded design that is 0.35 inches (9 mm) shorter, 0.16 inches (4 mm) narrower, 0.043 inches (1.1 mm) thinner, and 1.1 ounces (30 g) lighter than the previous Kindle 7, and features double the RAM (512MB) of its predecessor. The Kindle 8 is the first Kindle to use Bluetooth that can support VoiceView screen reader software for the visually impaired. It has the same screen display as its predecessor, a 167 ppi E Ink Pearl touch-screen display, and Amazon claims it has a four-week battery life and can be fully charged within four hours. Amazon released the Kindle Oasis (2nd generation), marketed as the "All-New Kindle Oasis" and colloquially referred to as the Oasis 2, on October 31, 2017. It is available in 8 GB Wi-Fi ($250 ad-supported, $270 no ads), 32 GB Wi-FI ($280 ad-supported, $300 no ads) and 32 GB Wi-Fi + 3G ($350 no ads) models with a 7-inch E Ink display with 300 ppi. It has an asymmetric design like the 1st generation Oasis, so it works for one-handed use, and the device finish is made from aluminum. The device color is a black front with either a silver or gold colored rear. The Oasis 2 is the first Kindle to be IPX8 rated so it is water resistant up to 2 meters for up to 60 minutes and first to be able to change the background black and the text to white that may be helpful for nighttime reading. It is frontlit with 12 LEDs and has ambient light sensors to adjust the screen brightness automatically. It supports playback of Audible audiobooks by pairing with A2DP supported external Bluetooth 4.2 speakers or headphones; the device can store up to 35 audiobooks with 8 GB or 160 audiobooks with the 32 GB model. The Oasis 2's internal battery lasts about six weeks of reading at 30 minutes a day. The Verge gave the Oasis 2 an 8/10, praising its design, display, and water resistance, but criticizing its high cost and the inability to read an e-book while its related audiobook is playing. Amazon announced the Kindle Paperwhite (4th generation) on October 16, 2018 and released it on November 7, 2018. It is available in 8 GB Wi-Fi ($130 ad-supported, $150 no ads), 32 GB Wi-Fi ($160 ad-supported, $180 no ads) and 32 GB Wi-Fi + 4G LTE ($250 no ads) models. It features a 6-inch plastic-backed display of Amazon's own design with 300 ppi and a flush screen featuring five LED lights. It is waterproof with an IPX8 rating, allowing submersion in 2 meters of fresh water for up to one hour. It supports playback of Audible audio books only by pairing with external Bluetooth speakers or headphones. The Verge gave the Paperwhite 4 an 8.5/10, praising its great display, water resistance and battery life but criticizing its lack of physical buttons and no USB-C support. Amazon announced the Kindle 9 on March 20, 2019 that features the first front light available on a basic Kindle. The front light uses 4 LEDs compared to the Paperwhite with 5 LEDs. Kindle 9 uses a 6-inch display with a higher contrast than previous basic Kindles and has the same 167 ppi resolution It has black and white colors and can use Bluetooth to connect headphones or external speakers. With the release of the Kindle Paperwhite in 2012, Amazon released a natural leather cover and a plastic back that is form-fitted for the device that weighs 5.6 ounces. The cover closes book-like from the left edge. The cover has magnets that activate the sleep/wake function in the Kindle when the cover is either closed or opened. The subsequent Amazon covers include this function. With the release of the Voyage in 2014, Amazon released two covers with either a polyurethane or a leather cover. The Voyage attaches to the rear of the Protective Cover magnetically and the case's cover folds over the top, and the case weighs 4.6 ounces. The case can fold into a stand, propping the Kindle up for hands-free reading. With the release of the Paperwhite (4th gen) in 2018, Amazon released three versions of its cover: a water-safe fabric cover that can withstand brief exposure to water, a standard leather cover and a premium leather cover; these covers all weigh 4 ounces. In May 2016, Amazon released the official Kindle Audio Adapter for reading e-books aloud via a text-to-speech (TTS) system for the blind and visually impaired. This accessibility accessory, initially supported only for the Paperwhite 3 and Oasis, plugs in the USB port and connects to headphones or speakers. Once connected, the reader uses the Voiceview for Kindle feature to navigate the interface and listen to e-books via TTS. This feature only supports e-books, not audiobooks or music. Using the accessory reduces the Paperwhite 3's battery life to six hours. As an alternative to the official adapter, a generic USB to audio converter will also work with Voiceview. Kindle devices support dictionary and Wikipedia look-up functions when highlighting a word in an e-book. The font type, size and margins can be customized. Kindles are charged by connecting to a computer's USB port or to an AC adapter. Users needing accessibility due to impaired vision can use an audio adapter to listen to any e-book read aloud on supported Kindles, or those with difficulty in reading text may use the Amazon Ember Bold font for darker text and other fonts may too have bold font versions. The Kindle also contains experimental features such a web browser that uses NetFront based on WebKit. The browser can freely access the Kindle Store and Wikipedia on 3G models while the browser may be limited to 50MB of data per month to websites other than Amazon and Wikipedia, Other possible experimental features, depending on the model are a Text-to-Speech engine that can read the text from ebooks and an MP3 player that can be used to play music while reading. The Kindle's operating system updates are designed to be received wirelessly and installed automatically during a period in sleep mode in which Wi-Fi is turned on. A user may install firmware updates manually by downloading the firmware for their device and copying the file to the device's root directory. The Kindle operating system uses the Linux kernel with a Java app for reading e-books. Amazon offers an email-based service called "Send-to-Kindle" that allows the user to send HTML pages, Microsoft Word documents, GIF, PNG, and BMP graphics directly to the user's Kindle library at Amazon. Sending the file is free if downloaded using Wi-Fi or $0.15 per MB when using a Kindle's 3G service. When Amazon receives the file, it converts the file to Kindle format and stores it in the user's online library (called "Your Content" by Amazon). In addition to the document types mentioned above, this service can be used to send unprotected MOBI files to a user's Kindle library. The Send-to-Kindle service's personal documents can be accessed by all Kindle hardware devices as well as iOS and Android devices using the Kindle app. 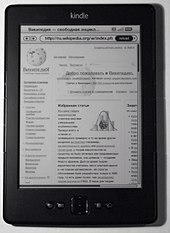 The first Kindle could read unprotected Mobipocket files (MOBI, PRC), plain text files (TXT), Topaz format books (TPZ) and Amazon's AZW format. The Kindle 2 added native PDF capability with the version 2.3 firmware upgrade. The Kindle 1 could not read PDF files, but Amazon provides experimental conversion to the native AZW format, with the caveat that not all PDFs may format correctly. The Kindle 2 added the ability to play the Audible Enhanced (AAX) format. The Kindle 2 can also display HTML files. The fourth/fifth/seventh/eighth generation Kindles, Touch, Paperwhite (1st, 2nd, 3rd & 4th generations), Voyage and Oasis (1st & 2nd generation) can display AZW, AZW3, TXT, PDF, unprotected MOBI, and PRC files natively. HTML, DOC, DOCX, JPEG, GIF, PNG, and BMP are usable through conversion. The Keyboard, Touch, Oasis 2, Kindle 8 and Paperwhite 4 can also play Audible Enhanced (AA, AAX) and MP3 files. The seventh generation Kindle, Kindle Paperwhite (2, 3 & 4), Voyage and Oasis (1 & 2) can display KFX files natively. KFX is Amazon's successor to the AZW3 (Kindle 8) format. An e-book may be downloaded from Amazon to several devices at the same time, as long as the devices are registered to the same Amazon account. A sharing limit typically ranges from one to six devices, depending on an undisclosed number of licenses set by the publisher. When a limit is reached, the user must remove the e-book from some device or unregister a device containing the e-book in order to add the e-book to another device. The original Kindle and Kindle 2 did not allow the user to organize books into folders. The user could only select what type of content to display on the home screen and whether to organize by author, title, or download date. Kindle software version 2.5 allowed for the organization of books into "Collections" which behave like non-structured tags/labels: a collection can not include other collections, and one book may be added to multiple collections. These collections are normally set and organized on the Kindle itself, one book at a time. The set of all collections of a first Kindle device can be imported to a second Kindle device that is connected to the cloud and is registered to the same user; as the result of this operation, the documents that are on the second device now become organized according to the first device's collections. There is no option to organize by series or series order, as the AZW format does not possess the necessary metadata fields. X-Ray is a reference tool that is incorporated in Kindle Touch and later devices, the Fire tablets, the Kindle app for mobile platforms and Fire TV. X-Ray lets users explore in more depth the contents of a book, by accessing pre-loaded files with relevant information, such as the most common characters, locations, themes, or ideas. Users can bookmark, highlight, and search through content. Pages can be bookmarked for reference, and notes can be added to relevant content. While a book is open on the display, menu options allow users to search for synonyms and definitions from the built-in dictionary. The device also remembers the last page read for each book. Pages can be saved as a "clipping", or a text file containing the text of the currently displayed page. All clippings are appended to a single file, which can be downloaded over a USB cable. Due to the TXT format of the clippings file, all formatting (such as bold, italics, bigger fonts for headlines, etc.) is stripped off the original text. On July 18, 2011, Amazon began a program that allows college students to rent Kindle textbooks from three different publishers for a fixed period of time. Kindle devices may report information about their users' reading data that includes the last page read, how long each e-book was opened, annotations, bookmarks, notes, highlights, or similar markings to Amazon. The Kindle stores this information on all Amazon e-books but it is unclear if this data is stored for non-Amazon e-books. There is a lack of e-reader data privacy — Amazon knows the user's identity, what the user is reading, whether the user has finished the book, what page the user is on, how long the user has spent on each page, and which passages the user may have highlighted. The New Yorker subscribed on a "Kindle Keyboard"
Content from Amazon's Kindle Store is encoded in Amazon's proprietary Kindle formats (.azw, .kf8 and .kfx). In addition to published content, Kindle users can also access the Internet using the experimental web browser, which uses NetFront. Users can use the Kindle Store to access reading material using the Kindle itself or through a web browser to access content. The store features Kindle Unlimited for unlimited access to over one million e-books for a monthly fee. Content for the Kindle can be purchased online and downloaded wirelessly in some countries, using either standard Wi-Fi or Amazon's 3G "Whispernet" network. Whispernet is accessible without any monthly fee or wireless subscription, although fees can be incurred for the delivery of periodicals and other content when roaming internationally beyond the customer's home country. Through a service called "Whispersync," customers can synchronize reading progress, bookmarks, and other information across Kindle hardware and other mobile devices. For U.S. customers traveling abroad, Amazon originally charged a $1.99 fee to download e-books over 3G while overseas, but later removed the fee. Fees remain for wireless 3G delivery of periodical subscriptions and personal documents, while Wi-Fi delivery has no extra charge. In addition to the Kindle Store, content for the Kindle can be purchased from various independent sources such as Fictionwise and Baen Ebooks. Public domain titles are also obtainable for the Kindle via content providers such as Project Gutenberg, The Internet Archive and the World Public Library. In 2011, the Kindle Store had more than twice as much paid content as its nearest competitor, Barnes & Noble. Public libraries that offer books via OverDrive, Inc. also loan titles for the Kindle and Kindle reading apps in the USA. Books are checked out from the library's own site, which forwards to Amazon for the completion of the checkout process. Amazon then delivers the title to the Kindle for the duration of the loan, though some titles may require transfer via a USB connection to a computer. If the book is later checked out again or purchased, annotations and bookmarks are preserved. Amazon released the Kindle for PC application in late 2009, available for Microsoft Windows systems. This application allows ebooks from Amazon's store or personal ebooks to be read on a personal computer, with no Kindle device required. Amazon released a Kindle for Mac app for Apple Macintosh & OS X systems in early 2010. In June 2010, Amazon released the Amazon Kindle for Android. Soon after the Android release, versions for the Apple iOS (iPhone and iPad) and BlackBerry OS phones were available. In January 2011, Amazon released Kindle for Windows Phone. In July 2011, Kindle for HP TouchPad (running webOS) was released in the U.S. as a beta version. In August 2011, Amazon released an HTML5-based webapp for supported web browsers called Kindle Cloud Reader. In 2013, Amazon has expressed no interest in releasing a separate Kindle application for Linux systems; the Cloud Reader can be used on supported browsers in Linux. On April 17, 2014, Samsung announced it would discontinue its own e-book store effective July 1, 2014 and it partnered with Amazon to create the Kindle for Samsung app optimized for display on Samsung Galaxy devices. The app uses Amazon's e-book store and it includes a monthly limited selection of free e-books. On June 2016, Amazon released the Page Flip feature to its Kindle applications that debuted on its e-readers a few years previously. This feature allows the user to flip through nine thumbnails of page images at a time. Concurrently with the release of the first Kindle device, Amazon launched Kindle Direct Publishing, used by authors and publishers to independently publish their books directly to Kindle and Kindle Apps worldwide. Authors can upload documents in several formats for delivery via Whispernet and charge between $0.99 and $200.00 per download. In a December 5, 2009 interview with The New York Times, Amazon CEO Jeff Bezos revealed that Amazon keeps 65% of the revenue from all e-book sales for the Kindle. The remaining 35% is split between the book author and publisher. After numerous commentators observed that Apple's popular App Store offers 70% of royalties to the publisher, Amazon began a program that offers 70% royalties to Kindle publishers who agree to certain conditions. Some of these conditions, such as the inability to opt out of the lendability feature, have caused some controversy. On January 21, 2010, Amazon announced the release of its Kindle Development Kit (KDK). KDK aims to allow developers to build "active content" for the Kindle, and a beta version was announced with a February 2010 release date. A number of companies have already experimented with delivering active content through the Kindle's bundled browser, and the KDK gives sample code, documentation and a Kindle Simulator together with a new revenue sharing model for developers. The KDK is based on the Java programming language's Personal Basis Profile packaged Java APIs. As of May 2014[update] Kindle store offered over 400 items labeled as active content. These items include simple applications and games, including a free set provided by Amazon Digital Services. As of 2014, active content is only available to users with a U.S. billing address. In October 2014, Amazon announced that the Voyage and future e-readers would not support active content because most users prefer to use apps on their smartphones and tablets, but the Paperwhite first generation and earlier Kindles would continue to support active content. Specific Kindle device sales numbers are not released by Amazon; however, according to anonymous inside sources, over three million Kindles had been sold as of December 2009, while external estimates, as of Q4-2009, place the number at about 1.5 million. According to James McQuivey of Forrester Research, estimates are ranging around four million, as of mid-2010. In 2010, Amazon remained the undisputed leader in the e-reader category, accounting for 59% of e-readers shipped, and it gained 14 percentage points in share. According to an International Data Corporation (IDC) study from March 2011, sales for all e-book readers worldwide reached 12.8 million in 2010; 48% of them were Kindles. In the last three months of 2010, Amazon announced that in the United States its e-book sales had surpassed sales of paperback books for the first time. In January 2011, Amazon announced that digital books were outselling their traditional print counterparts for the first time ever on its site, with an average of 115 Kindle editions being sold for every 100 paperback editions. In December 2011, Amazon announced that customers had purchased "well over" one million Kindles per week since the end of November 2011; this includes all available Kindle models and also the Kindle Fire tablet. IDC estimated that the Kindle Fire sold about 4.7 million units during the fourth quarter of 2011. Pacific Crest estimated that the Kindle Fire models sold six million units during Q4 2012. Morgan Stanley estimates that Amazon sold $3.57 billion worth of Kindle e-readers and tablets in 2012, $4.5 billion in Kindle device sales in 2013 and $5 billion in Kindle device sales in 2014. Working Kindles in good condition can be sold, traded, donated or recycled in the aftermarket. Due to some Kindle devices being limited to use as reading device and the hassle of reselling Kindles, some people choose to donate their Kindle to schools, developing countries, literacy organizations, or charities. "The Kindle Classroom Project" promotes reading by distributing donated Kindles to schools in need. Worldreader and 'Develop Africa' ships donated e-readers to schools in developing countries in Africa for educational use. 'Project Hart', a non-profit created in the legacy of Michael S. Hart, will take donations of e-readers that can be refurbished to give to people in need. Whether in good condition or not, Kindles should not be disposed of in normal waste due to the device's electronic ink components and batteries. Instead, Kindles at the end of their useful life should be recycled. In the United States, Amazon runs their own program, 'Take Back', which allows owners to print out a prepaid shipping label, which can be used to return the device for disposal. Upon your payment of the applicable fees set by Amazon, Amazon grants you the non-exclusive right to keep a permanent copy of the applicable Digital Content and to view, use and display such Digital Content an unlimited number of times, solely on the Device or as authorized by Amazon as part of the Service and solely for your personal, non-commercial use. Amazon spokesman Drew Herdener said that the company is "changing our systems so that in the future we will not remove books from customers' devices in these circumstances." On July 23, 2009, Amazon CEO Jeff Bezos posted on Amazon's official Kindle forum an apology about the company's handling of the matter. Bezos said the action was "stupid", and that the executives at Amazon "deserve the criticism received". For copies of Works purchased pursuant to TOS granting "the non-exclusive right to keep a permanent copy" of each purchased Work and to "view, use and display [such Works] an unlimited number of times, solely on the [Devices]... and solely for [the purchasers'] personal, non-commercial use", Amazon will not remotely delete or modify such Works from Devices purchased and being used in the U.S unless (a) the user consents to such deletion or modification; (b) the user requests a refund for the work or otherwise fails to pay for the work (e.g., if a credit card issuer declines payment); (c) a judicial or regulatory order requires such deletion or modification; or (d) deletion or modification is reasonably necessary to protect the consumer, the operation of a device or network used for communication (e.g., to remove harmful code embedded within an e-book on a device). On September 4, 2009, Amazon offered all affected users a choice of restoring of the deleted e-books or receiving an Amazon gift certificate or check for $US30. In December 2010, Amazon removed three e-books written by Selena Kitt for violations of Amazon's publishing guidelines. For what Amazon describes as "a brief period of time", the books were unavailable for redownload by users who had already purchased them. This ability was restored after it was brought to Amazon's attention; however, no remote deletion took place. 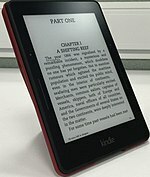 In October 2012, Amazon suspended the account of a Norwegian woman who purchased her Kindle in the United Kingdom, and the company deleted every e-book on her Kindle. Amazon claimed that she had violated their terms of service but did not specify what she had done wrong. After the woman contacted the media, Amazon restored her account and her purchased e-books. The event serves to remind Kindle users that even when a user clicks buy, the user only holds a license to view works that can be revoked by Amazon at any time for violating the terms of service. Richard Stallman criticized the Kindle, citing Kindle terms of service which can censor users, which require the user's identification, and that can have a negative effect on independent book distributors; he also cited reported restrictions on Kindle users, as well the ability for Amazon to delete e-books and update software without the users' permission. ^ Source Code Notice Amazon.com, Retrieved June 1, 2017. ^ "Amazon.com Help: Kindle Paperwhite (7th Generation) Software Updates". Amazon.com. Retrieved March 31, 2019. ^ "Amazon.com Help: Kindle Oasis (8th Generation) Software Updates". Amazon.com. Retrieved March 31, 2018. ^ "Amazon Kindle 1st-gen review". gdgt. Archived from the original on July 4, 2009. Retrieved September 3, 2013. ^ Dudley, Brier (November 19, 2007). "Kindle hacking, iPod parallels and a chat with the Kindle director". Seattle Times. Archived from the original on December 21, 2010. Retrieved December 28, 2010. ^ a b Kindle Store: Kindle eBooks. Retrieved March 30, 2018. ^ "Online Etymology Dictionary: kindle". Retrieved May 1, 2012. ^ Friedman, Nancy (December 9, 2008). "How the Kindle got its name". nancyfriedman.typepad.com. Retrieved April 5, 2012. ^ Perez, Sarah (May 18, 2010). "Kindle for Android Is Coming". The New York Times. ^ Kindle Cloud Reader Amazon.com. ^ a b "Amazon Kindle 1st generation". Amazon.com. ^ Patel, Nilay (November 21, 2007). "Kindle Sells Out in 5.5 Hours". Engadget.com. Archived from the original on November 23, 2007. Retrieved November 21, 2007. ^ Sorrel, Charlie (April 21, 2008). "Amazon's Kindle Back in Stock". Wired.com. pp. "Gadget Lab" blog. Archived from the original on April 22, 2008. Retrieved April 21, 2008. ^ a b "Amazon Kindle FAQ". Amazon.com. Retrieved June 10, 2009. ^ "Amazon.com: Kindle 2nd generation Free 3G". ^ "Kindle Wireless Reading Device (6" Display, U.S. Wireless): Kindle Store". Amazon.com. Retrieved August 18, 2011. 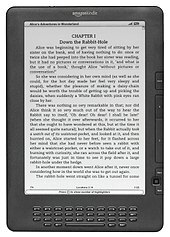 ^ "Kindle 2: Amazon's 6" Wireless Reading Device (Latest Generation)". Amazon.com. Retrieved June 10, 2009. ^ "Amazon Press Event: Kindle 2 announced". Retrieved February 9, 2009. ^ "Kindle 2 Frequently Asked Questions". Amazon.com. Archived from the original on February 11, 2009. Retrieved February 11, 2009. ^ "Kindle 2 First Look". iFixit.com. Archived from the original on February 25, 2009. Retrieved February 25, 2009. ^ "UR, Exclusively on Amazon's Kindle". Stephen King. Archived from the original on February 12, 2009. Retrieved February 10, 2009. ^ "Amazon cuts price of Kindle to $259". CNNMoney.com. October 7, 2009. Archived from the original on May 1, 2011. Retrieved April 17, 2011. ^ Slattery, Brennon (April 22, 2009). "Amazon's $359 Kindle 2 Costs $185.49 to Build". PC World. Archived from the original on April 25, 2009. Retrieved April 22, 2009. 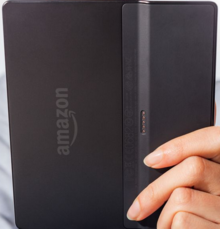 ^ a b "Amazon Extends Battery Life of Newest Kindle by 85 Percent and Adds Native PDF Reader". News Release. Amazon. Retrieved November 21, 2009. ^ Levy, Steven (October 6, 2009). "Kindle Goes International – With a Little Help From AT&T". Wired. Archived from the original on December 24, 2010. Retrieved December 2, 2010. ^ Stone, Brad (May 3, 2009). "Looking to Big-Screen e-Readers to Help Save the Daily Press". The New York Times. ^ "Kindle DX - Released 2009 - Fact Sheet". ^ "Help: Kindle (2nd Generation) and Kindle DX Software Updates". Amazon.com. Retrieved April 15, 2014. ^ Kehe, Marjorie (January 6, 2010). "Kindle DX: Amazon takes on the world". The Christian Science Monitor. Archived from the original on January 10, 2010. Retrieved January 6, 2010. ^ Amazon. "Kindle DX Wireless Reading Device, Free 3G, 3G Works Globally, Graphite, 9.7" Display with New E Ink Pearl Technology: Kindle Store". Amazon.com. Archived from the original on May 1, 2011. Retrieved March 19, 2011. ^ a b c d e "Kindle 3G Wireless Reading Device, Free 3G + Wi-Fi, 6" Display, 3G Works Globally – Latest Generation". Amazon.com. Retrieved August 18, 2011. ^ "New Generation Kindles Are the Fastest-Selling Kindles Ever and Already the Best-Selling Products on Amazon". ^ Loeffler, Shawn (August 6, 2010). "Amazon Kindle 3". CraveOnline. Retrieved December 28, 2010. ^ Palmer, Jay (August 14, 2010). "Amazon's Kindle 3". Barrons.com. Retrieved March 19, 2011. ^ Pepitone, Julianne (July 29, 2010). "Is Kindle 3 a game-ender for e-reader wars?". CNN. ^ "Kindle Keyboard 3G". Retrieved November 27, 2013. ^ Pogue, David (August 25, 2010). "New Kindle Leaves Rivals Farther Back". The New York Times. Retrieved December 28, 2010. ^ "AT&T to Sponsor Kindle 3G". 2011. ^ "Kindle 3 Review". Review Horizon. Retrieved December 1, 2011. ^ Kindle (2010) (August 27, 2010). "Amazon Kindle review (2010)". Engadget. Retrieved December 1, 2011. ^ "Kindle Touch 3G – no more web browsing via 3G?". Amazon.com. Retrieved October 10, 2012. ^ a b "Amazon limits monthly Kindle browsing over 3G to 50 MB — Tech News and Analysis". Gigaom.com. July 24, 2012. Retrieved August 28, 2013. ^ "MarketWatch.com". MarketWatch.com. Retrieved August 28, 2013. ^ "Reading Enhancements". amazon.com. Retrieved December 13, 2014. ^ a b "Kindle Paperwhite e-reader announced, $119 Wi-Fi and $179 3G models ship October 1st". The Verge. September 6, 2012. Retrieved September 7, 2012. ^ Kinder, Lucy (September 7, 2012). "Comparing Amazon's new Kindles". The Telegraph. Retrieved December 9, 2012. ^ "Kindle Paperwhite – Touch Screen Ereader with Built-In Light". US: Amazon. Retrieved September 7, 2012. ^ Gruber, John (October 10, 2012). "Kindle Paperwhite". Daring Fireball. Retrieved October 14, 2012. There should not just be buttons for page-turning, but great buttons. [...] require fonts that were chosen or designed with the limitations of e-ink in mind.[...] a dedicated e-reader in 2012 has no excuse for not including a good auto-hyphenation algorithm. ^ "Amazon adds Goodreads integration and more to first-gen Kindle Paperwhite — Tech News and Analysis". Gigaom.com. Retrieved May 12, 2014. ^ Cooper, Daniel (June 7, 2013). "Amazon's Kindle comes to China: Paperwhite for $138, Fire HD for $244 (16GB) or $293 (32GB)". Engadget. Retrieved August 28, 2013. ^ Brian Heater. "Amazon Kindle Paperwhite review". Engadget. ^ "Amazon Admits That the Kindle Paperwhite Has Some Problems". US: Gizmodo. October 12, 2012. Retrieved August 28, 2013. ^ "Kindle Paperwhite – Touch Screen Ereader with Built-In Light". UK: Amazon. Retrieved August 28, 2013. ^ "Amazon's Next Kindle Paperwhite Leaks Early, Now Available To Pre-Order For U.S. Shoppers". TechCrunch. September 3, 2013. Retrieved September 3, 2013. ^ Engadget. "The year in reviews: 2013's best and worst gadgets scored and scrutinized". Engadget.com. Retrieved December 31, 2013. ^ "Kindle New Touchscreen Display, Exclusive Kindle Software, Wi-Fi". ^ Amazon Kindle Voyage review: Amazon's best e-reader yet. Retrieved Feb 24, 2015. ^ "Kindle Voyage Next-Gen Paperwhite Display, Highest-Resolution, Highest Contrast, New Adaptive Front Light, Reimagined Page Turns, Wi-Fi or Wi-Fi + Free 3G". ^ Laura Hazard Owen. "Amazon's new high-end e-reader, the Kindle Voyage, starts at $199 but has fancy page turns". ^ Chris Ziegler. "Amazon Kindle Voyage review". The Verge. Retrieved December 17, 2014. ^ Pierce, David (June 17, 2015). "The New Kindle Paperwhite Is Perfect for Picky Readers". Wired. Retrieved June 17, 2015. ^ Cunningham, Andrew (June 18, 2015). "Amazon undercuts its high-end e-reader with new 300 PPI Kindle Paperwhite". Ars Technica. Retrieved June 18, 2015. ^ New Bookerly Font and Typography Features. Retrieved 16 June 2015. ^ "The Improved "Bookerly" Font Is Now Available For Most Kindles". Co.Design. August 11, 2015. ^ White Kindle Paperwhite Available Worldwide Starting Next Week The Digital Reader, Retrieved 24 June 2016. ^ Chris Ziegler (June 23, 2015). "Amazon Kindle Paperwhite (2015) review". The Verge. Retrieved June 24, 2015. ^ Trent McGee (March 14, 2015). "Amazon Kindle Paperwhite e-Reader (2015) Review". Popzara. Retrieved March 14, 2015. ^ "Meet Amazon's New E-Reader, the Kindle Oasis". Fortune. Retrieved April 13, 2016. ^ Pogue, David (May 19, 2016). "My Favorite Things, Part II". Yahoo Tech. Retrieved May 20, 2016. ^ Amazon Develops a new Kindle Font called Ember Goodreader, Retrieved April 27, 2016. ^ Samual Gibbs (April 26, 2016) Amazon Kindle Oasis review: the luxury e-reader really is something special The Guardian, Retrieved April 27, 2016. ^ Katherine Boehret (May 4, 2016) Amazon Kindle Oasis review The Verge Retrieved 2 June 2016. ^ "Amazon's new Kindle is only $80 and comes in white". arstechnica.com. Retrieved July 12, 2016. ^ "All-New Kindle E-reader - Black, 6" Glare-Free Touchscreen Display, Wi-Fi". Amazon. Retrieved July 12, 2016 – via Amazon. ^ Amazon’s new Kindle Oasis is (finally) waterproof and a little less expensive Ars Technia, Retrieved October 13, 2017. ^ Nate Hoffelder (March 13, 2018). "Kindle Oasis Now Available in Champagne Gold - The Digital Reader". The Digital Reader. ^ "New Kindle Oasis is Waterproof, Costs $249, and Has a 7" Screen". The Digital Reader. Retrieved October 11, 2017. ^ Casey Newton (October 31, 2017) Amazon Kindle Oasis 2017 e-book reader review The Verge Retrieved 15 December 2017. ^ "All-new Kindle Paperwhite". Amazon. Retrieved October 16, 2018. ^ "Hands On With the New Waterproof Amazon Kindle Paperwhite". PCMag. Retrieved October 20, 2018. ^ Amazon Kindle Paperwhite (2018) review: the new best-seller The Verge Retrieved 21 November 2018. ^ Amazon Kindle (2019 Gsmarena Retrieved 20 March 2019. ^ "3 Cover Options from Amazon for New Kindle Paperwhite - The eBook Reader Blog". blog.the-ebook-reader.com. ^ Voiceview for Kindle Works on the Kindle Oasis and Voyage, and Other Things Amazon Didn’t Tell You The Digital Reader, Retrieved 12 May 2016. ^ "Accessing Basic Web". Amazon.com. Archived from the original on November 22, 2007. Retrieved November 22, 2007. ^ "Using Wireless Outside the United States". Retrieved August 10, 2012. ^ "Kindle Software Updates". Amazon.com. Retrieved November 27, 2009. ^ Amazon.com Help: Fire & Kindle Software Updates Amazon.com Retrieved 22 February 2016. ^ "Reading Personal Documents on your Kindle". Amazon.com. Archived from the original on November 21, 2007. Retrieved November 22, 2007. ^ "Help: Kindle Personal Documents Service". Amazon.com. Retrieved October 10, 2012. ^ "Reading Personal Documents on Your Kindle". Amazon.com. 2007. pp. "How to Use Your Kindle" section. Archived from the original on November 22, 2007. Retrieved November 23, 2007. ^ Amazon (2009). 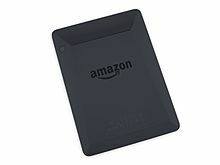 "Amazon.com: Kindle 2: Amazon's New Wireless Reading Device (Latest Generation): Kindle Store". Amazon. Archived from the original on February 24, 2009. Retrieved March 7, 2009. ^ "Kindle Touch: Touchscreen e-Reader with Wi-Fi and E Ink Display". Amazon.com. September 30, 2011. Retrieved September 30, 2011. ^ "Help: Organizing Your Kindle Content on". Amazon.com. Retrieved August 18, 2011. ^ "Help: Managing Your Kindle on". Amazon.com. Retrieved August 18, 2011. ^ Butler, Kenneth (September 28, 2011). 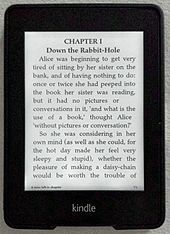 "Video: Amazon Kindle Touch's X-Ray Reference Tool Makes eReading Easier". laptopmag.com. Retrieved September 5, 2013. ^ "Kindle User Guide" (PDF). Amazon.com. Archived (PDF) from the original on February 6, 2009. Retrieved February 7, 2009. ^ Larry Dignan, ZDNet. "Amazon launches Kindle textbook rentals." July 18, 2011. Retrieved July 18, 2011. ^ Cohn, Cindy (November 29, 2012). "2010: E-Book Buyer's Guide to E-Book Privacy". Electronic Frontier Foundation. Retrieved December 8, 2013. Stores last page read and may store annotations, highlights, markings, etc. ^ The Fifty Shades of Grey Paradox. Slate. Feb 13, 2015. 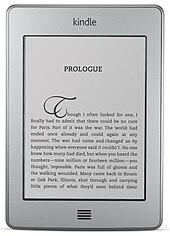 ^ "Kindle Wireless Reading Device, Wi-Fi, Graphite, 6" Display with New E Ink Pearl Technology: Kindle Store". Amazon.com. Archived from the original on May 1, 2011. Retrieved March 19, 2011. ^ "NetFront Browser Gives Amazon Kindle Customers On-Device Access to Information-Rich Websites like Wikipedia.org". ^ "Kindle Wireless Reading Device - 2nd Generation". Amazon.com. Archived from the original on June 21, 2010. Retrieved August 14, 2010. ^ "What is the Amazon Whispernet wireless feature and how does it work?". Amazon.com. Archived from the original on November 22, 2007. Retrieved December 30, 2009. ^ "Kindle for iPhone home page". Archived from the original on May 1, 2011. Retrieved December 30, 2009. ^ Kafka, Peter. "That Was Fast: Kindle, Meet the iPhone". Retrieved December 30, 2009. ^ "Traveling with Your Kindle". Amazon.com. Retrieved September 17, 2015. ^ King, Sammy. "Survey of Kindle, Nook, iPad, Sony and OverDrive eBook Store Collection Size". eBookReaderGuide.com. Retrieved March 13, 2011. ^ "Amazon.com: Public Library Books for Kindle". Retrieved September 11, 2013. ^ Slattery, Brennon (November 10, 2009). "Kindle for PC Released, Color Kindle Coming Soon?". PC World. Archived from the original on October 28, 2010. Retrieved December 2, 2010. ^ Miller, Ross (March 18, 2010). "Kindle for Mac now finally available". Engadget. AOL. Retrieved December 2, 2010. ^ Bilton, Nick (June 28, 2010). "Amazon Releases Kindle App for Android Phones". The New York Times. Retrieved December 2, 2010. ^ "Amazon release Kindle for Windows Phone 7". PC in pact. ^ "Now you can curl up with a good book (or two, or three, or 950,000) on your TouchPad". Palm. July 18, 2011. ^ "Amazon's Answer To Apple's Terms: A Web-Based Kindle Cloud Reader – Brilliant On PC, Better On iPad". TechCrunch. August 9, 2011. Retrieved August 18, 2011. ^ "Kindle Cloud Reader Opens Up Options for Linux and iPad Users". Ostatic.com. 2013. Retrieved May 12, 2014. ^ Lunden, Ingrid (April 17, 2014). "Samsung and Amazon Team Up For Custom Galaxy Kindle E-Book App". TechCrunch. ^ "Amazon 'Page Flip' Lets You Easily Skim Through Ebooks". ^ a b Munarriz, Rick Aristotle (November 27, 2007). "Why Kindle Will Change the World". Motley Fool. Retrieved November 27, 2007. ^ Solomon, Deborah (December 6, 2009). "Questions for Jeffrey P. Bezos: Book Learning". The New York Times. Archived from the original on March 29, 2011. Retrieved December 22, 2009. ^ Henry Blodget (January 20, 2010). "Amazon Fires Missile At Book Industry, Launches 70% Kindle Royalty Option". Businessinsider.com. Retrieved August 18, 2011. ^ Blue, Violet (2012). "Piracy witch hunt downs legit e-book lending Web site". Cnet. Retrieved August 10, 2012. ^ "Amazon Announces Kindle Development Kit--Software Developers Can Now Build Active Content for Kindle". Amazon.com. January 21, 2010. Retrieved January 21, 2010. ^ Johnson, Alex (January 26, 2010). "Amazon to launch app store for Kindle e-reader". International Business Times. Retrieved December 28, 2010. ^ "Products tagged with kindle active content". Amazon.com. Retrieved May 18, 2014. ^ "Amazon.com: Amazon Digital Services: Kindle Store". Amazon. May 2012. ^ Amazon Drops Support for Kindle Active Content From the Kindle Voyage The Digitial Reader, October 27, 2014. ^ Arrington, Michael (January 29, 2010). "3 Million Amazon Kindles Sold, Apparently". TechCrunch. Archived from the original on April 17, 2010. Retrieved April 18, 2010. ^ Radcliffe, Mitch (December 26, 2009). "Updating Kindles sold estimate: 1.49 million". ZDNet. Archived from the original on January 1, 2010. Retrieved December 28, 2009. ^ Wilhelm, Alex (July 29, 2010). "How Many Kindles Have Been Sold?". The Next Web. Retrieved December 2, 2010. ^ Mark Walsh, mediapost.com. "Kindle, Nook Gain In E-Reader Race Archived April 30, 2011, at the Wayback Machine." March 29, 2011. Retrieved March 29, 2011. ^ Nearly 18 Million Media Tablets Shipped in 2010 with Apple Capturing 83% Share; eReader Shipments Quadrupled to More Than 12 Million. Archived November 13, 2012, at the Wayback Machine Press release by IDC, 10. March 2011. ^ "Amazon Kindle e-book downloads outsell paperbacks". BBC News. January 28, 2011. Archived from the original on April 24, 2011. Retrieved May 2, 2011. ^ "Amazon Kindle Book Sales Soar". ^ Alistair Barr: Amazon touts 'one million per week' Kindle sales. 19. December 2011. ^ Thomas Claburn (April 7, 2012). "iPad Mini: 6 Reasons Apple Must Do It". InformationWeek. Retrieved April 13, 2012. ^ Jay Yarow (December 19, 2012). "Amazon Kindle Fire Sales Estimates". Business Insider. Retrieved August 28, 2013. ^ "How Big Is Amazon's Kindle Business? Morgan Stanley Takes a Crack - Jason Del Rey - Commerce". AllThingsD. August 12, 2013. Retrieved April 15, 2014. ^ "How to sell or get rid of your old gadgets". CNN. December 26, 2012. ^ "The Kindle Classroom Project". ^ "Worldreader - Empower the World to Read, Give Reading". Worldreader. Retrieved November 27, 2015. ^ Project Hart Retrieved 28 March 2016. ^ a b Stone, Brad (July 18, 2009). "Amazon Erases Orwell Books From Kindle". The New York Times. p. B1. ^ a b "Plaintiff's Complaint in Justin GAWRONSKI and A. BRUGUIER v. Amazon.com, Inc" (PDF). PR News Channel. July 30, 2009. ^ "Why Amazon went Big Brother on some Kindle e-books". Ars Technica. July 17, 2009. Retrieved July 19, 2009. ^ Fried, Ina (July 17, 2009). "Amazon says it won't repeat Kindle book recall – CNet News". News.cnet.com. Retrieved August 18, 2011. ^ Fowler, Geoffrey A (July 30, 2009). "Lawsuit: Amazon Ate My Homework". The Wall Street Journal. ^ "Amazon settles lawsuit over deleted Kindle copy of '1984'". Tech flash. September 30, 2009. Archived from the original on April 24, 2011. Retrieved March 19, 2011. ^ James Maguire (March 31, 2008). "Richard Stallman, Live and Unplugged". Datamation. Retrieved September 4, 2015. ^ "Hacktivist Richard Stallman takes on proprietary software, SaaS and open source". Gigaom. August 6, 2013. Retrieved September 4, 2015. ^ Phil Johnson (June 11, 2015). "Don't call it Linux! And other things that tick off Richard Stallman". IT World. Retrieved September 4, 2015. ^ Diksha P Gupta (March 19, 2012). "An Interview with Richard Stallman on Freedom, Android, Amazon, Facebook, Steve Jobs…". Open Source For U. Retrieved September 4, 2015. Wikimedia Commons has media related to Amazon Kindle. Rose, Charlie (November 19, 2007), CEO Jeff Bezos about the Kindle (interview), archived from the original (video) on November 22, 2007 .